Torrent-streaming platform Popcorn Time has been causing headaches for the movie and TV industries ever since it emerged early last year. While the project’s original developers stopped working on it after legal pressure, it was swiftly forked by a number of new teams that have kept it up and running. While Popcorn Time has been available on Android for some time, it’s now arrived on iOS with an installer that can put the app on non-jailbroken devices. It’s likely that it uses a test key from an enterprise device to achieve that. The new development could cause serious headaches for both Apple and legal streaming services like Netflix. In fact, Netflix itself singled out Popcorn Time as a serious competitor in a shareholder letter earlier this year. TNW has tested the Popcorn Time iOS app and it works as advertised – almost instantaneously streaming movies and TV shows on your device. The app is rough around the edges, the interface is nothing fancy – buttons are often oversized – and it can be laggy, but users will most likely put up with those minor inconveniences to get their hands on a large library of pirated content. Like the desktop version, the new iOS incarnation of Popcorn Time has native AirPlay and Chromecast support. This is one of those stories you can expect to run and run. So far, no one has been able to knock out Popcorn Time and I suspect not even Apple will be able to shut it down, although it will no doubt move swiftly to try. 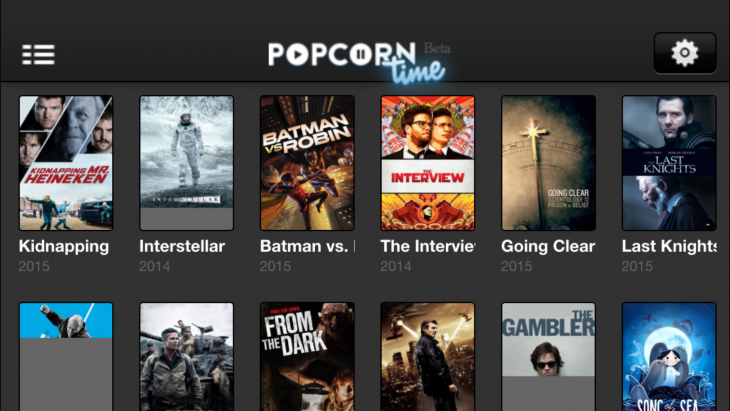 We’ve chosen not to link to the Popcorn Time for iOS installer in this story. It’s only available for Windows currently but the developers say an OS X version will arrive in the next few weeks. They also released a video full of movie parodies celebrating their one year anniversary, which is pretty damn brazen. We have contacted Apple for comment and will update this post with further details if and when it responds. Read next: Who is Happy shares your joy at smoking a joint, but what's the point?